Dazzle yourself with this dramatic display of fashion from Apples of Gold jewelry collection. An art deco-styled band, cast in white gold, sets a clean slate for your ring, but also brings the flair of excellently carved scrollwork. Two coils of yellow gold pique your interest, and for good reason. The yellow gold is the foundation for the main attraction: a brilliant peridot gemstone. Measuring 6mm, the light green stone offers exceptional sparkle for this Apples of Gold ring. 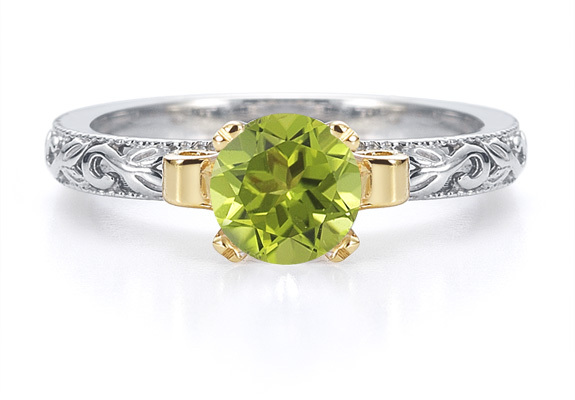 We guarantee our 1 Carat Art Deco Peridot Engagement Ring to be high quality, authentic jewelry, as described above.